When installing a separate 32 bit web application in a SharePoint 2013 Farm the new application might fail to load and give a general 503 Service Unavailable error message. When looking in IIS manager, the Application Pool for the new app would be in the stopped state. 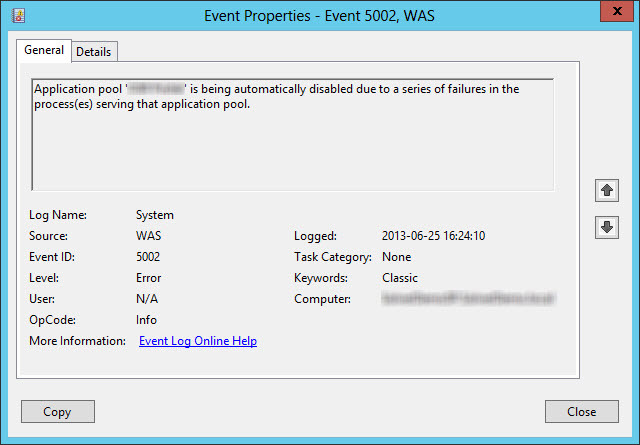 Application pool ‘<App Pool Name>’ is being automatically disabled due to a series of failures in the process(es) serving that application pool. A listener channel for protocol ‘http’ in worker process ‘<process number>’ serving application pool ‘<App Pool Name>’ reported a listener channel failure. The data field contains the error number. The Module DLL ‘C:\Program Files\Common Files\Microsoft Shared\Web Server Extensions\15\isapi\spnativerequestmodule.dll’ could not be loaded due to a configuration problem. The current configuration only supports loading images built for a x86 processor architecture. The data field contains the error number. To learn more about this issue, including how to troubleshooting this kind of processor architecture mismatch error, see http://go.microsoft.com/fwlink/?LinkId=29349. The Microsoft link for the issue will only redirect you to the www.iis.net web site. Hat Tip to my colleague Markus Lind for pointing this out. This entry was posted in General, SharePoint and tagged How To, IIS, Microsoft, SharePoint on 2013-07-01, Monday by Stefan Johansson.